The tale was inspired and loosely based on a real-life incident over the Fourth of July weekend in 1947 in Hollister, California, (publicized in an issue of Harper's Magazine in a January 1951 article titled "The Cyclists' Raid" by Frank Rooney), when about four thousand people, composed of motorcyclists and other visitors and enthusiasts, roared into the town over a two day period, and overwhelmed the facilities. However, they did not ransack the town, confront the locals, or cause civil unrest (except for some arrests for drunkenness, or urinating in public - often due to a lack of restrooms). In the film, most of the action was located in Wrightsville, somewhere in Middle America. Because of the controversial nature of the film, public screenings were banned in England by the British Board of Film Censors for fourteen years (until 1968) after its release. Even in America, it was feared that the shocking, 'Communist' movie glamorized a anti-social subculture in revolt, would set a bad example, and cause impressionable viewers to copy-cat its plot and incite deliquency and riots. In fact, it took many years for pacifist motorcyclists to overcome stereotypes and fabrications promoted by the film. James Dean's disaffected, frustrated youth Jim Stark in Rebel Without a Cause (1955), Elvis Presley's anti-hero character in Jailhouse Rock (1957), and even the significant counter-cultural Easy Rider (1969) - plus a spate of exploitation biker films (i.e., Roger Corman's trashy B-film classic The Wild Angels (1966)) - owe their existence to this original, cult classic film. 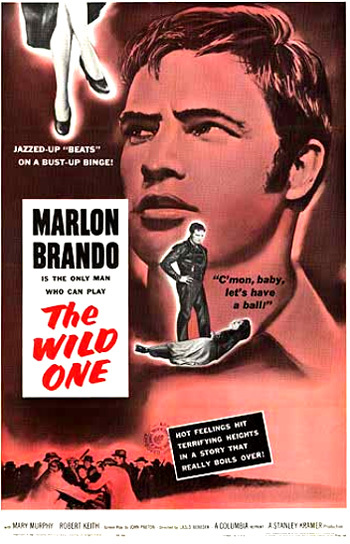 Although Marlon Brando portrays a stunning, brooding, nomadic character in one of his central and early roles (his fifth screen role), the film lacked Academy Award nominations. The sale of black leather jackets and motorcycles reached new heights after the film's release, and motorcycles became a symbol of youth rebellion. 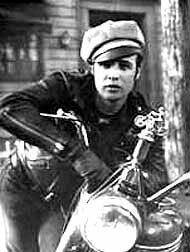 The film's poster of Brando leaning on his motorcycle (see below) remains a best-seller. This is a shocking story. It could never take place in most American towns - but it did in this one. It is a public challenge not to let it happen again. It begins here for me on this road. How the whole mess happened, I don't know. But I know it couldn't happen again in a million years. Maybe I could have stopped it early. But once the trouble was on its way, I was just goin' with it. Mostly, I remember the girl, I, I can't explain it - sad chick like that. But somethin' changed in me. She got to me. But that's later, anyway. This is where it begins for me right on this road. Gradually, the tiny blurs on the horizon and the low rumble that is heard turn into figures of 40 black leather-jacketed cyclists who roar directly into the stationary, low-angled camera. The motorcycle gang rides in a tightly-knit squadron formation, led by sideburned Johnny (Marlon Brando), the narrator. He is a surly, sneering and rebellious sort, wearing the trademark black-leather jacket (with Johnny scrawled on the left chest), round dark shades, white T-shirt, bulky aviator's cap, skin-tight jeans, black gloves and boots. I dunno - everywhere. I don't even think they know where they're goin'...Ten guys like that give people the idea everybody drives a motorcycle is crazy. What are they tryin' to prove anyway? The Sheriff answers: "Beats me. Lookin' for somebody to push 'em around so they can get sore and show how tough they are...They usually find it someplace, sooner or later." Jimmy, you better put some more beer on ice. There were guys all over the street tryin' to miss him...and he's alright, but he's got one of my boys all busted up. Kathie: Do you want something? Johnny: (inhaling) Yeah. I'd like a bottle of beer. Art - that's silly. Your car's OK, you're OK. And that's lucky - the way you drive. Johnny: Say, you live here all the time? Johnny: We've been over to Carbonville at the meet. Kathie: A bunch of motorcycles came through this way yesterday. They didn't stop. (Gesturing toward his trophy) Is that what they give you in those races for killing yourself? Johnny: That's right. You want it? Hmm? Johnny: (He pushes it towards her on the counter.) Well, go on, take it, go ahead. Kathie: Can't do that. You won it. You have to get your name engraved on it, or whatever you do. It's important to you. You don't - you don't give something like that away just like that, not unless you knew a girl real well and, well, you liked her. When one of his gang members asks if they are going to stay around town or leave ("Are we gonna get out of this dump? "), Johnny tells them that they will remain a while longer - and then looks up at Kathie, obviously attracted to her and interested in spending more time to get to know her better. - "What do you hicks do around here for kicks?" - "The roses grow. People get married. Crazy as anyplace else." - "What about TV? Do ya like TV?" - "Oh, pictures! No, no pictures. Everything these days is pictures. Pictures and a lot of noise. Nobody even knows how to talk. Just grunt at each other." Kathie: Where are you going when you leave here? Don't you know? Johnny: (scoffing) Oh man, we just gonna go. Johnny: Well, on the weekends, we go out and have a ball. Johnny: A picnic? Man, you are too square. I'll have to straighten you out. Now, listen, you don't go any one special place. That's cornball style. You just go. (He snaps his fingers.) A bunch gets together after all week it builds up, you just...the idea is to have a ball. Now if you gonna stay cool, you got to wail. You got to put somethin' down. You got to make some jive. Don't you know what I'm talkin' about? Envious of his ability to move on whenever he wishes, Kathie tells him she knows what he means: "My father was going to take me on a fishing trip to Canada once...We didn't go." Her life has been one of stultifying, small-town repression, denial, and restriction. Johnny pulls Kathie toward him and tries to dance with her, but she walks away, explaining that she doesn't dance very well. When she calls the Sheriff "Dad" and Johnny learns that Kathie is the sheriff's daughter, she asks why he tried to act so rudely toward her father ("Why are you trying to be so rude?"). He leans toward her and snaps back: "I don't like cops," grabs the trophy from the counter, and prepares to leave with his gang. I love you, Johnny. I've been looking for ya in every ditch from Fresno to here, hopin' you was dead. Aw, don't take that away from Chino. It's so beautiful. Chino needs it. Makes Chino feel like a big strong man. Chino wants to be a big racetrack hero with all these girls. Pow, huh! Look, I didn't win it, Johnny. I just gleeped it. But I gleeped it off a guy that didn't win it either. Look, Johnny, you want one? How about you go gleep one someplace yourself, huh? This lovely young lady over here shall hold this beautiful object signifying absolutely nothing. Now watch closely, see how the timid maiden of the hill clutches the gold to her breast, and see how she fights back a tear, while her hero bleeds to death in the street.